The picturesque churches is one of the islands most popular characteristics. You see them everywhere, so don't miss to visit them. Ok, maybe not all of them because they are many... Too many actually... Only in the Mykonos town and an area of ​​about one square km, there are more than sixty old churches and throughout the island visitors can see smaller chapels that surpass the number of 400! Several of these humble places of worship have been declared by the Ministry of Culture as protected historical monuments. It is said that they were so many small churches on the island as the many days of the year. Nowadays, they remain an integral part of daily life of the locals and a beautiful background of the visitors photos. 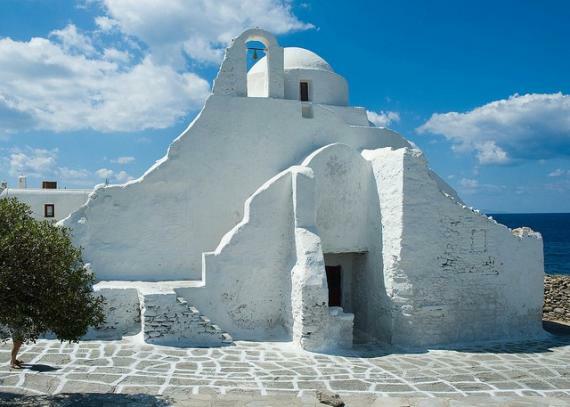 Regardless of however else you choose to enjoy your time in Mykonos, do give some of it to visit the island's churches. Most churches of Mykonos have a simple construction, with the characteristic red-brick color to the outside of the roofs. Some are very old but the majority of them dated to the 17th, 18th and 19th century. The island has also many old monasteries, with very interesting architecture and remarkable works of religious art. The Paraportiani is one of Greece's most recognizable structures. It combines a number of architectural styles into a single building. Begun to built in the late 14th century and not completed until the 17th century, it is actually a collection of five attached churches. This lovely church with the high bell tower is located just outside Mykonos town. It is a functioning monastery and home to a museum of religious objects. The church and monastery were rebuilt in 1767 and include a marble fountain in the yard. The Virgin Tourliani is also host to the island's most important religious festival, the Feast of the virgin, celebrated on August 15th of each year. Τhis convent is located in one of the island's rare green spots, along a hill outside of Ano Mera. It's known for its classical Cycladic architectural style, dating from the late 18th century. Within the convent are vibrant icons and altars. The Catholic Church of Virgin Rodario is the island's only Catholic church. It's in Mykonos town, in Alefcandra Square. This tiny church has undergone a number of changes over the centuries, including the burning of its Sanctuary Walk in 1991. Even so, this church dedicated to the Virgin of St. Rosario is still a functioning church visited by thousands of Catholics each year.